It is not very often that my mum gets a chance to come down to London. So on this special occasion, I decided to take her out for some dosas. 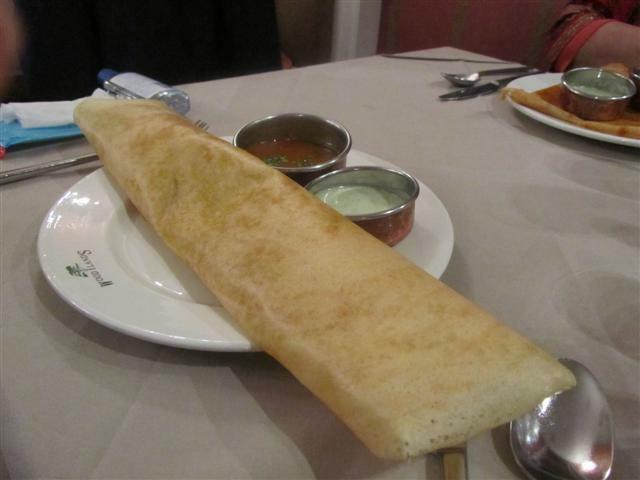 Dosas are thin pancakes made from ground lentils and rice, which are then fermented. The first place that came to mind was the Woodlands restaurant. I knew that their speciality is dosas as well as other south Indian dishes. They also have north Indian dishes on the menu. 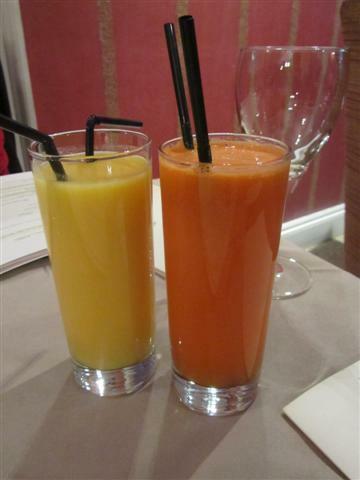 To start the meal, we had two colourful drinks. The freshly squeezed apple, carrot and ginger juice was pretty refreshing. The mango lassi was made with Alphonso mangoes and yoghurt. I am used to mango lassi having a thick consistency but this one was fairly thin. It was still enjoyable though. There were many starters on the menu that looked interesting but then we decided only to go for two, so that we would have room for our main dosa meal. The waiter said that it would be better not to choose the idli for the starter if we were having dosas later. This was because they are made from the same ingredients of rice and lentils and they are also served with the same sauces as the dosa. Taking that into account, we made the decision to have the Special Upma and the Paneer Lal Mirch. 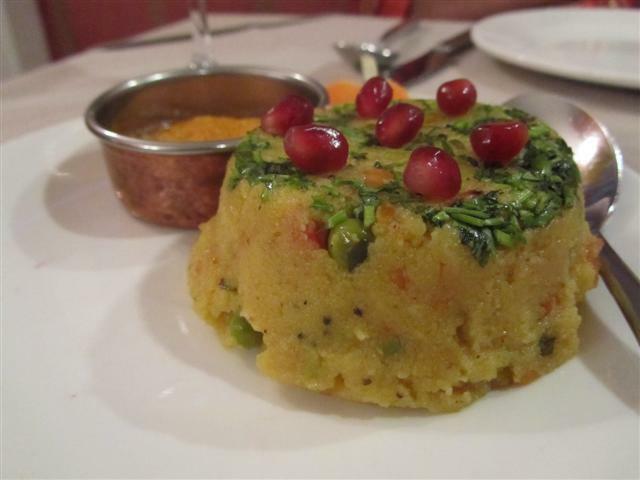 The Special Upma was a soft savoury semolina dish. It was delicately spiced and had peas, carrots and cashew nuts in it. It was presented as a dome topped with pomegranate seeds and a Mysore coconut chutney on the side. 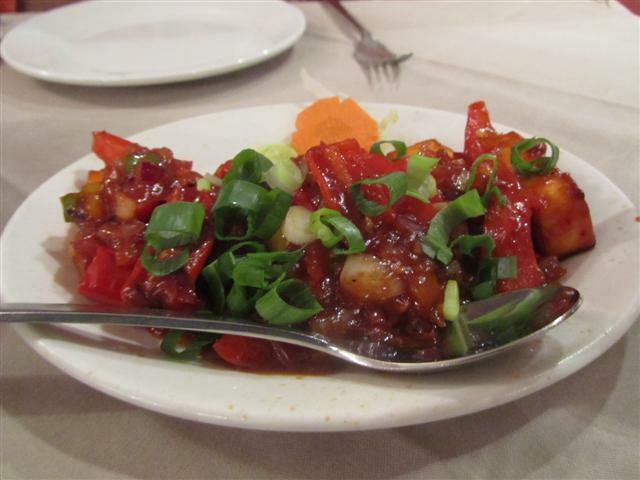 The Paneer Lal Mirch was cubes of Indian cottage cheese with slices of red chillies and red peppers. It was a saucy dish with a sweet and sour flavour. The sauce had cooked onions and spring onions in it. The paneer cubes were of a good size and it was a good combination of flavours. Now onto our main dosa meal that we had come especially for. Again, we took the recommendation from the waiter who said that the Mysore Masala Dosa was one of his favourites. This dosa had the classic potato filling but it was cooked with butter and came with a spicy red chutney. It was served folded into a triangle. The other dosa that we had was the normal Masala Dosa. This was served as a long tube and was filled with potatoes, peas and onions. Both dosas were generously filled and had good sized chunks of potato in them. 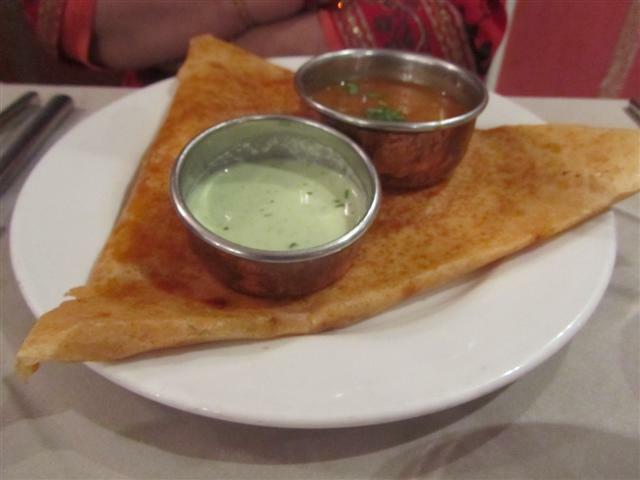 The dosas were served with sambar which is a lentil dipping sauce and also with coconut chutney. The dosas really were great and did not disappoint us in any way. They both had a good taste and the combination with the fillings and the sauces and chutneys worked perfectly together. Dessert had to be done and there were again lots of choice on the menu. The Kulfi Falooda was a nice way to end the meal. The slices of malai kulfi ice cream with the rose syrup took me right back to my childhood days when we used to have rose syrup milkshakes! 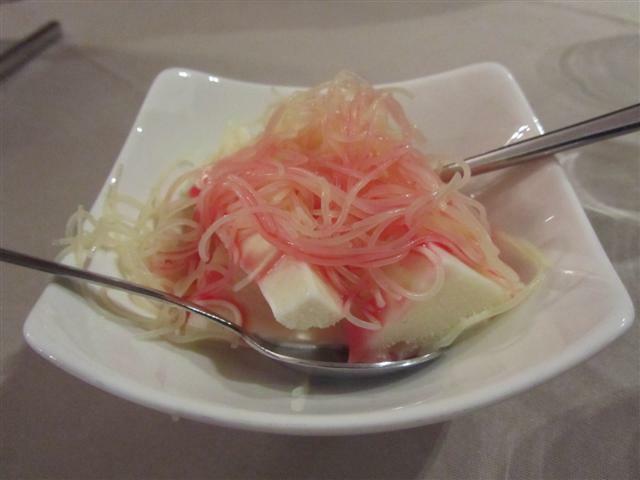 The kulfi was topped with strands of vermicilli and nuts. Woodlands was decorated with beige furniture and soft lighting. 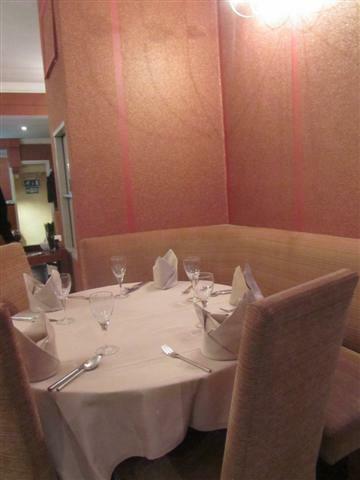 The restaurant felt clean and well maintained. Even though it is not a huge restaurant, it still feels fairly spacious. The staff were more than happy to give recommendations when we asked them their opinion on the dishes. They were honest and if they did not know, then they went and asked their manager. 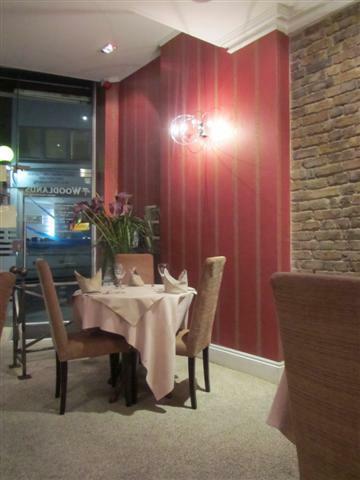 The staff all gave such lovely service and were very attentive. They made us feel comfortable and very welcome and it seemed like they really valued our custom. Dining at Woodlands was really great and it was even better that I got to spend the evening out with my mum. Nothing beats that. Sorry to hear that you had such a bad experience. I feel that it is important to inform you that our branch in Hampstead has undergone a lot of changes such as, staff has been changed and we have a new and very capable manager, named Miguel. I can honestly that the restaurant looks and feels different for the better, to what it did when you visited. In light of the changes we have made, I would like to invite you back to the restaurant to experience the changes first hand. 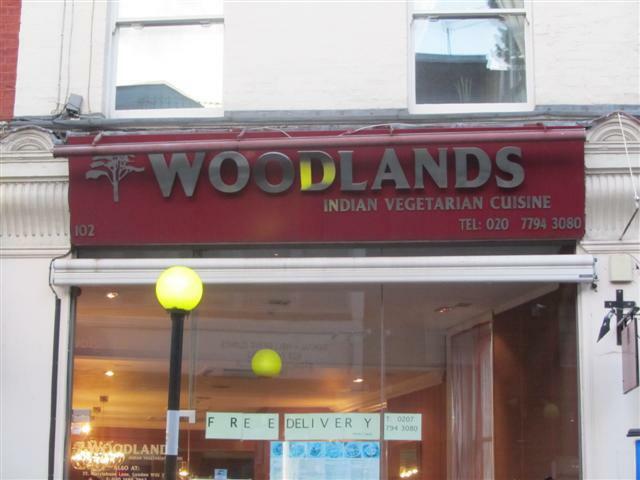 We have been trading in London for 32 years and serving the finest Indian Vegetarian Cuisine. All our guests are very important to us and I would like you to give us a chance to put things right. Glad you enjoyed it. I always found the service rather weird – the place is always empty and they just hover at the end of the room. Not attentive, just chatting among themselves. Last time I was there, we saw a couple of big cockroaches by our table after the meal. Too bad, because the dosas were fine.